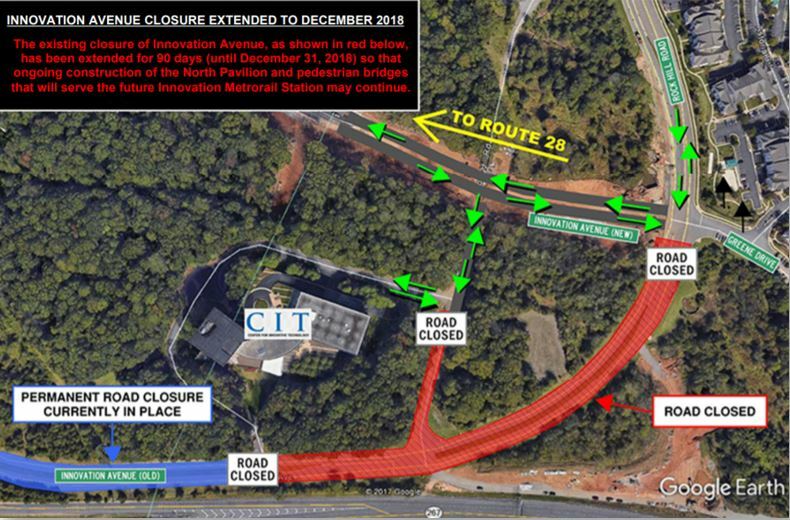 The temporary closure of the old Innovation Avenue alignment southeast of the Center for Innovative Technology (CIT) building has been extended for 90 days, until the end of December 2018, so construction of the North Pavilion and pedestrian bridge for the Silver Line Innovation Center Metrorail Station may continue. The closure is located between Greene Drive and the currently closed section of old Innovation Avenue. All residences and businesses, including the CIT building, will remain accessible from the new Innovation Avenue alignment and Rock Hill Road. See details below.